Showing latest posts tagged in "WebGL"
Bringing high quality games to your browser w/ Artillery! That's right, I'm now a full-time member of the Artillery Team, eager to push the limits of browser gaming farther every day. I've already spent the last 6 months there as a software engineer intern and WebGL afficionado, working on some sweet rendering techniques, shaping up our WebGL renderer and working on Project Atlas. Project Atlas is a high quality RTS we've been working on with Day that will use the power of HTLM5 and WebGL to provide a top-notch experience through our very own platform! I hope you'll enjoy this video as much as we enjoyed working on it and the platform behind it. Stay tuned on Twitter: Mine, Artillery's and Day's. Today I'm finally releasing Shdr, a side project I've been working on for a few months that has been sitting in my GitHub for a while. 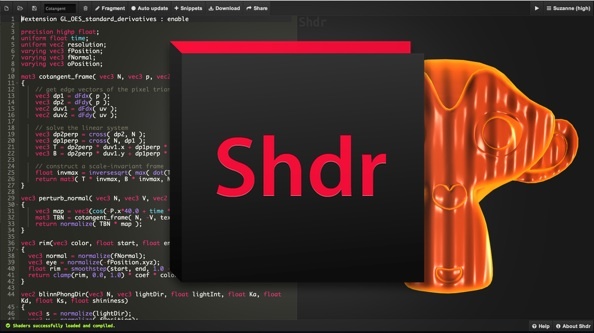 Shdr is an online GLSL (ESSL) shader editor, viewer and validator written in CoffeeScript/WebGL that I decided to code while working on HexGL. Indeed, I've been looking for a tool to help me quickly iterate over shader development and didn't find any that would fit my needs. Head past after the break for the full release notes, info and screenshots. What's coming next for HexGL? What am I working on right now? Head past after the break to know the answers. 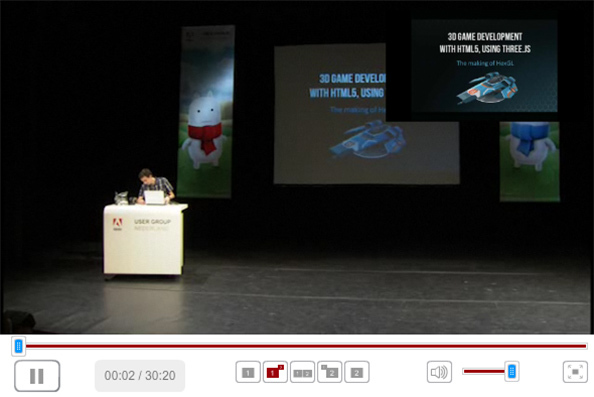 (Video) My Adobe User Group NL talk is online. Above is a video of my recent talk about three.js and HexGL at the Adobe User Group NL meetup. In this presentation, I'm talking about game development and workflows when using three.js to make a 3D game, taking my recent work with HexGL as an example. You can also find my slides of this presentation on slideshare. Introducing HexGL, a WebGL racing game! This video is a quick trailer for my upcoming WebGL game: HexGL. Read past the break to learn more about it. This article will be covering the technique behind the volumetric light approximation (VLA) aka godrays I used in my latest OpenGL project to simulate sun shafts, but this time in WebGL, with a point light. Check out the demo and the code after the break. After experimenting more with Three.js, and working with more complex scenes and setups, I recently felt the need of a structured manager to handle multiple scenes, cameras and render loops. Indeed, working with more than one scene/camera/render setup can quickly become messy, juggling with many variables for each setup. To counter this, I developped a tiny Three.js extension: THREE.Extras.RenderManager. Head past after the break to download and learn more about it.